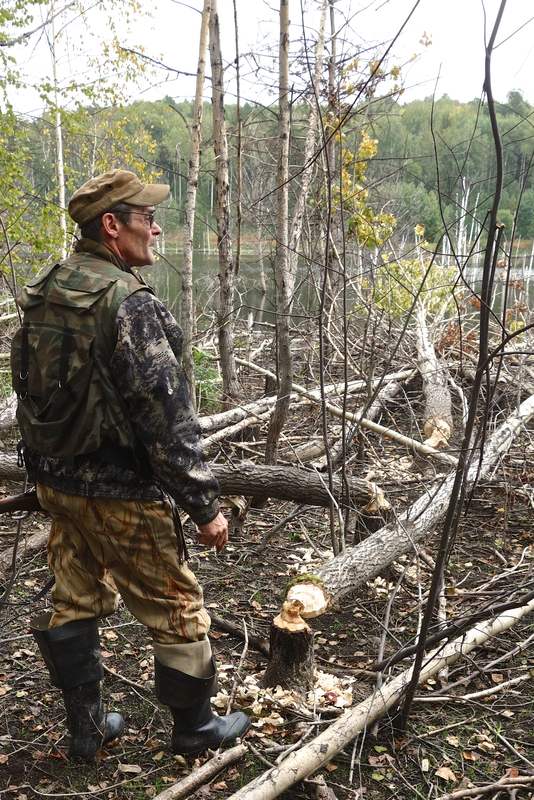 A few months ago, before the Ukrainian Crisis flared up, I was invited on a hunting trip in Chelyabinsk Oblast. Never one to turn down an opportunity, I heartily accepted. After the downing of MH17 and issues in East Ukraine, I was a bit concerned, but decided to go anyway as Donetsk is over a thousand miles from Chelyabinsk. 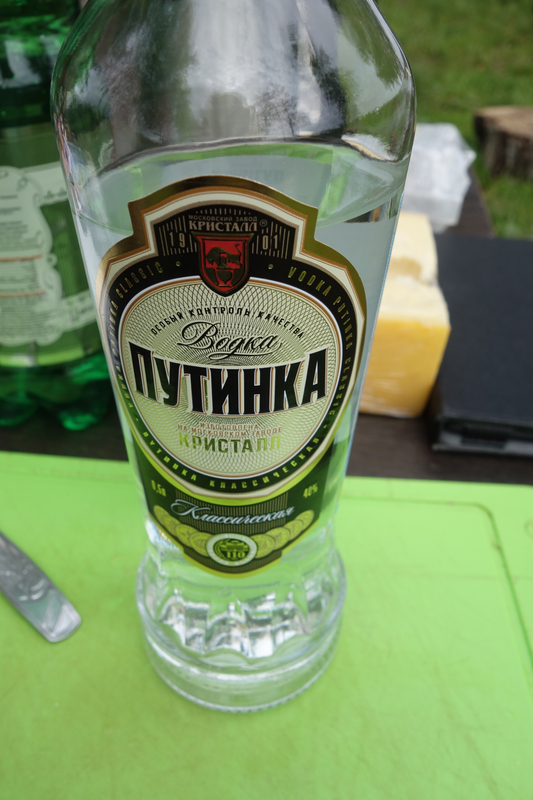 One complication of the hunt was that my Russian vocabulary consists of about 20 words, and the English vocabulary of my hosts was similar. Fortunately, gesticulations, charades, and Google Translate would prove up to the task. 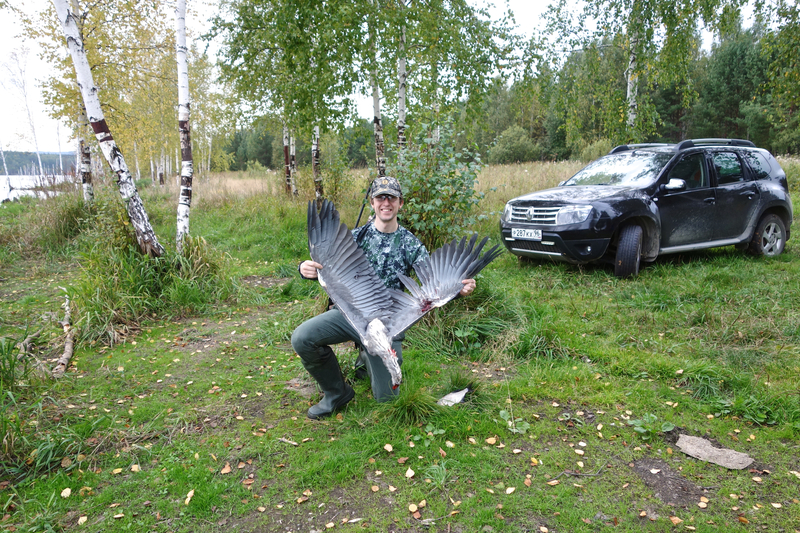 On the morning of the 4th, my host picked me up from Yekaterinburg we met our two other fellow hunters and drove approximately 200 km south to Chelyabinsk Oblast. Crossing the border between Sverdlovsk and Chelyabinsk, the road quality fell from formula one to world rally, but our car had four wheel drive, so we were fine. Deep in Chelyabinsk we stopped at the station of a “егерь” or “jäger” who provided us with some tips on location of local quarry. My understanding is that the Russian government leases some wilderness to private individuals on a 50-year basis. The individual often hires a егерь to manage the land, count game, prevent poaching, and charge legitimate hunters for access. 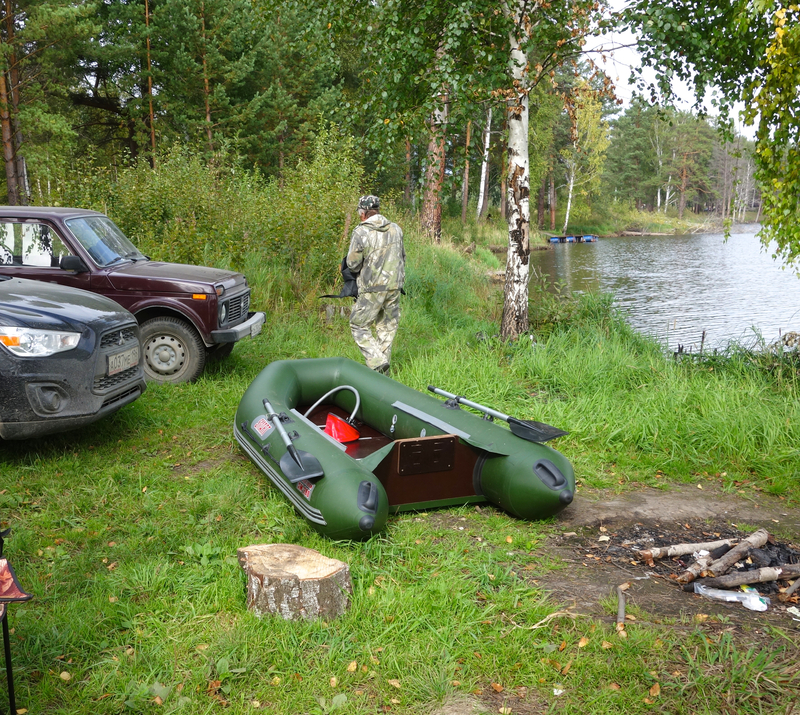 After arriving at our hunting area we established a camp, inflated the boats, and ate a traditional lunch: sausage, homemade bread, cheese, and “Putinka” brand Vodka (in moderation of course). 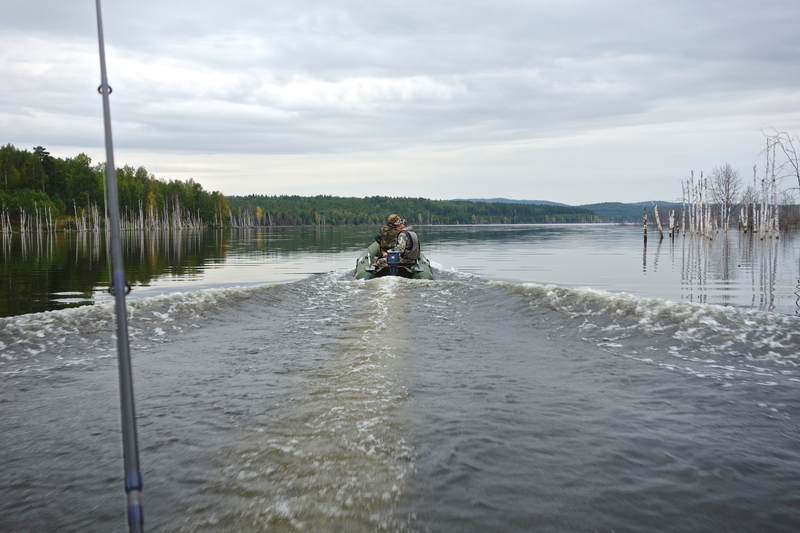 Initially, the four of us went out on two boats, but one had engine troubles, so instead, I went out hunting on foot. 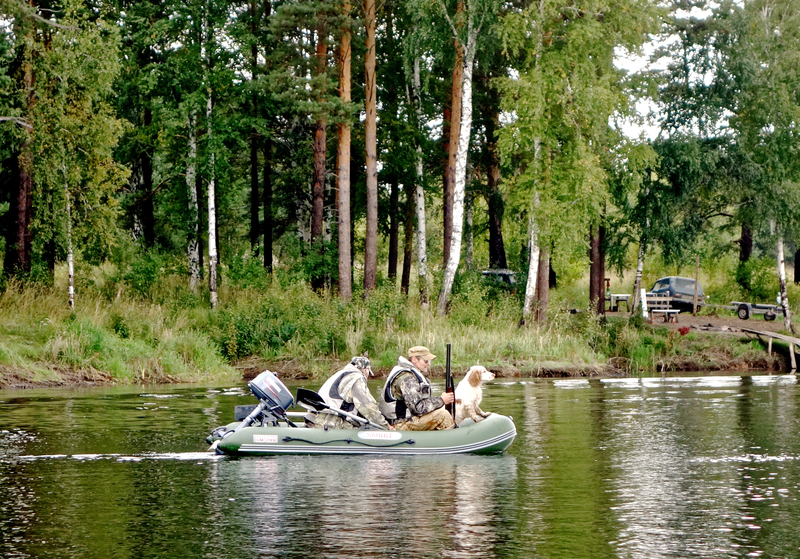 My guide was my host’s friend accompanied by his Russian Spaniel, Charlie, as our gun dog. 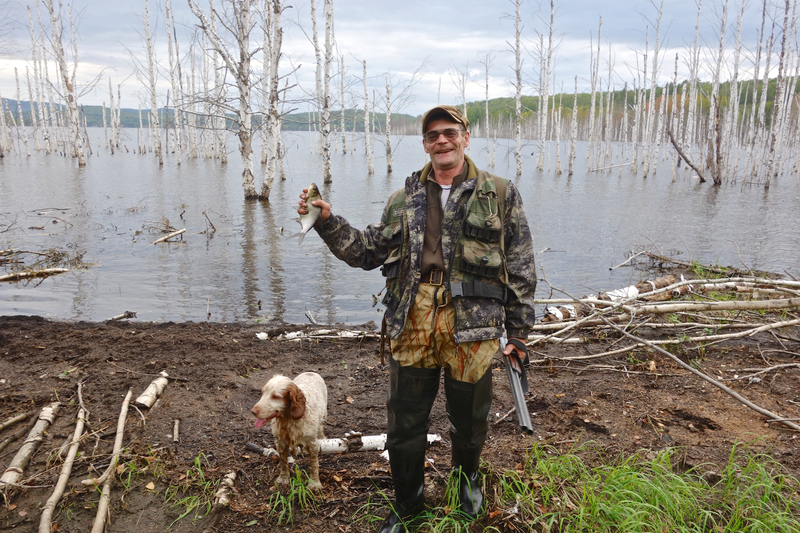 As we were hunting upland game, I carried a borrowed Molot Bekas Auto semi-automatic 12 ga loaded with No. 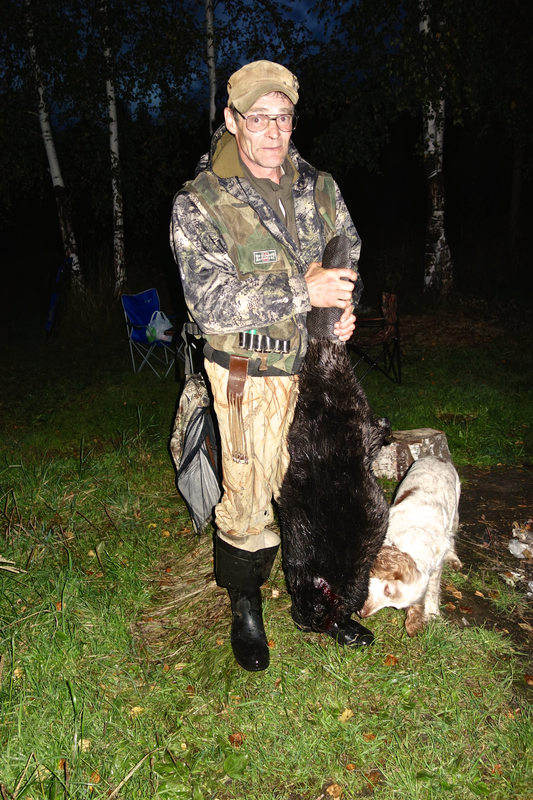 5 shot and he carried a Baikal over-under 12 ga.
Charlie was a champion Russian Spaniel. 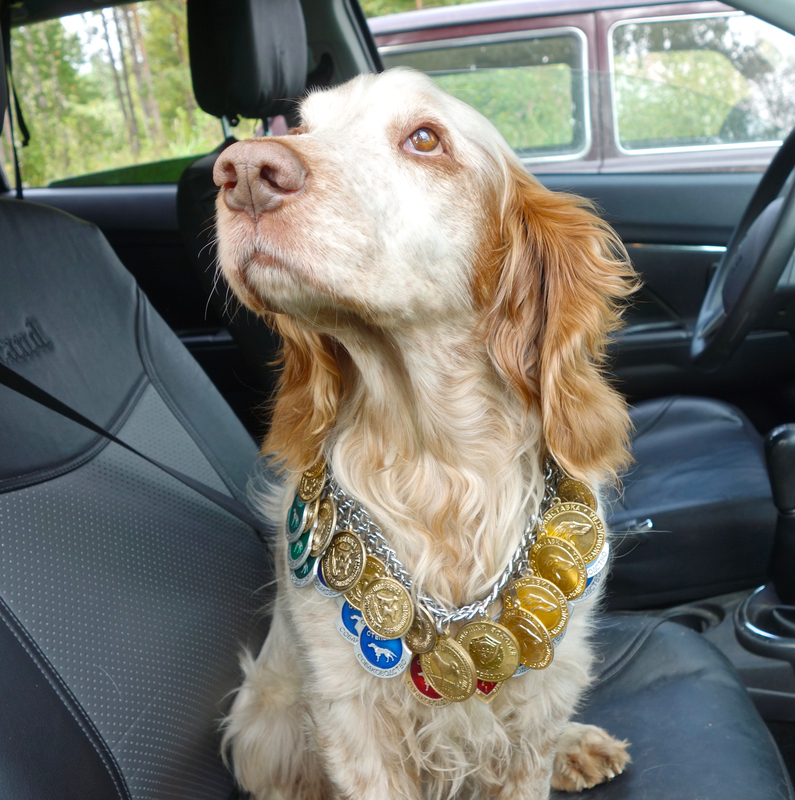 An excellent gun dog. The hunt was pretty standard. My fellow hunter and I walked 15-40 yards apart with Charlie sweeping the brush between us to flush birds. The prey was mostly Brown Grouse and Woodcock. The brush was was 6 ft high at times, and the mud was ankle deep. My host was kind enough to lend me Wellington boots, which were indispensable. We spotted obvious signs of beaver. I took a common grey heron to supply our dinner. In a hilarious “only in Russia” moment, as we were walking a few feet from a lake, my hunting partner spotted a fish mere inches below the surface. 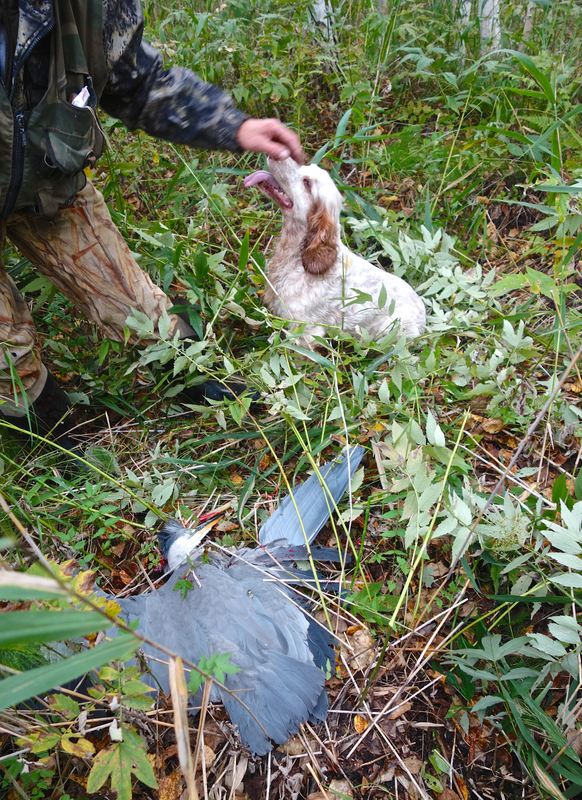 With a quick shot, he wounded it with the 12 ga., Charlie dove into the water after it, and grabbed it by the tail. 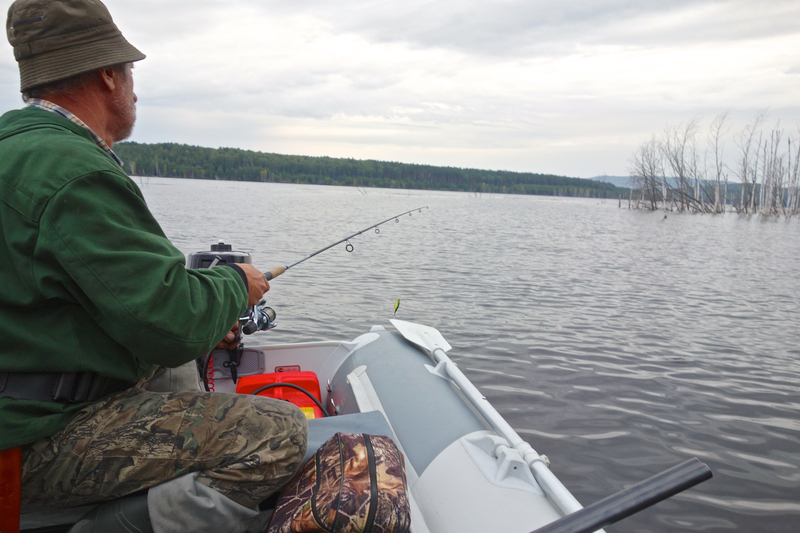 Fishing with a shotgun… you learn something new everyday. Afterwards, we returned to camp and met up with the other two hunters. Sun was setting so my host and I set out for some small coves to wait for ducks. 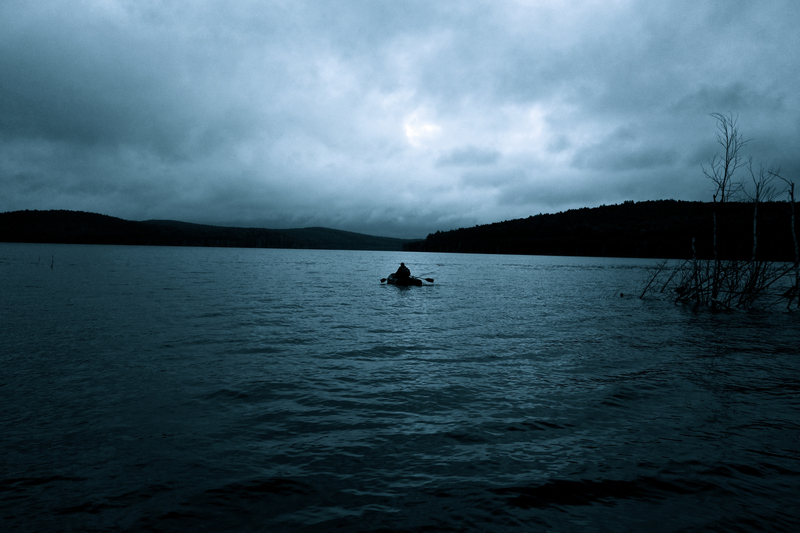 The others went to a different cove. Sun fully set, so we headed back to camp. The others were still hunting. A single shotgun blast rang out. Quite surprising to fire a single round at a flock of ducks. In about 15 minutes, the other hunters returned, and we learned why they fired only one shot, they bagged a large beaver! 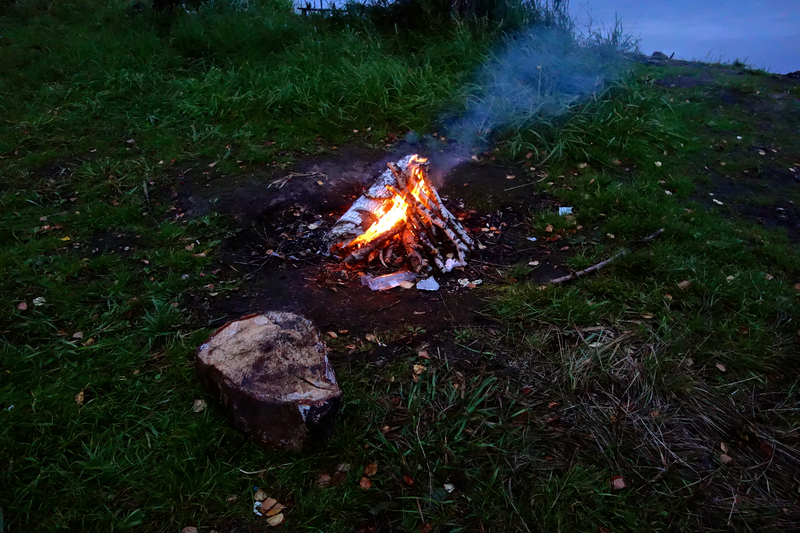 We build a fire, dressed the heron and beaver, and made a stew with the heron. The stew was a pretty traditional, first the dressed heron was added to boiling water until cooked, then carrots and onions, and finally potatoes were added. Seasonings rounded it out. 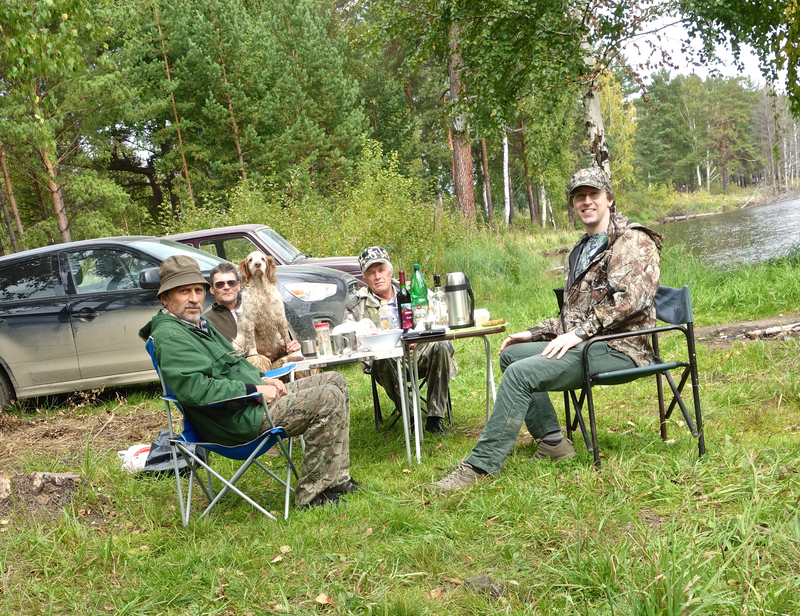 When ready, we had a dinner of heron stew, bread, and more vodka. Skinning and dressing the beaver took at least an hour, so we finally called it a night at 1 am. Below is a gallery for anyone who wants to see a beaver skinned and dressed. It was a pretty serious effort.